Brighton and Hove Albion will host Tottenham Hotspur in a Premier League clash at the Amex Stadium on Tuesday evening, with Chris Hughton's side desperate to avoid returning to the ​Championship after just one season in the top flight. Meanwhile, Spurs will seek to consolidate their position in the top four against a side ​they defeated 2-0 in the reverse fixture at Wembley. Both sides will be looking to bounce back after disappointing defeats last weekend - ​the Lilywhites were outplayed by City at Wembley, while ​the Seagulls succumbed to Crystal Palace at Selhurst Park after conceding three first half goals. ​​​Brighton's defeat against fellow strugglers ​Crystal Palace extended their winless run to four games, a dismal sequence in which the Seagulls have picked up just one point. Yet Brighton's chaotic defending against the Eagles was not at all typical of their displays this season. The Seagulls have shipped just 46 Premier League goals, the joint lowest tally in the bottom half of the table - and only one more than sixth-placed ​Arsenal. Brighton will hope that they can rediscover the excellent form they showed in February and early March, picking up 10 out of a possible 12 points and ​beating the Gunners 2-1 at the Amex. Spurs' home defeat against City ended a 14-match unbeaten run in the ​Premier League, with the Lilywhites winning six in a row before the City game. Although they look highly likely to qualify for the Champions League for the third season in a row, Spurs may still be looking nervously over their shoulder at fifth-placed Chelsea, who are just seven points behind their London rivals with five matches left to play. The 2017/18 season is Brighton's first in the Premier League, and indeed their first in the top flight since their relegation from the old First Division in 1983. 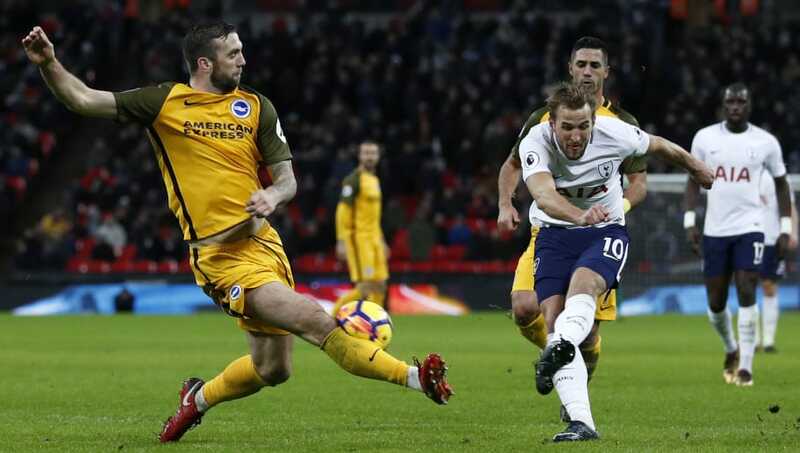 The Seagulls may draw some encouragement from ​their only previous Premier League meeting with Spurs, as the home side struggled to break down Brighton's dogged defence. In fact, Spurs needed a large slice of luck to open the scoring in the 40th minute, as Serge Aurier's misdirected cross from the right looped over the hapless Seagulls keeper Matt Ryan into the net. The home side dominated Brighton throughout the match, hitting the woodwork through Erik Lamela and Harry Kane, yet they only sealed their win in the 88th minute, when Son Heung-min headed home a Christian Eriksen free kick. Brighton will be without Dutch midfielder Davy Pröpper, who was dismissed against ​Huddersfield earlier this month. The club's appeal against his red card was rejected, so he still has two matches of his three-match ban remaining. Meanwhile, Steve Sidwell is still sidelined with a long-term injury, as is England youth international Izzy Brown, who is on loan from ​Chelsea. Spurs will be without midfielder Harry Winks, who is still out with an ankle injury which may put him out of contention for England's FIFA World Cup squad. Defender Kyle Walker-Peters is also sidelined with a hamstring strain. In more positive news for Spurs, Danny Rose may be available for selection on Tuesday, after a calf injury ruled him out against City on Saturday. What a superb season Glenn Murray has had. Yes, the former Crystal Palace striker was guilty of an extraordinary miss against his former side on Saturday. But his 12 league goals have given Brighton every reason to hope that they could still be playing Premier League football next season. The 34-year-old forward is not a complicated or rounded player - he just has a rare knack for scoring goals, both with his feet and with his head. He may fancy his chances against ​Tottenham centre back Davinson Sánchez, whose dire display against City was a major factor in Spurs' defeat. The Colombian will need to defend with far more conviction if he is to shut out the Seagulls' top scorer on Tuesday. Spurs showed on Saturday that they still need to improve if they are to compete with the very best. However, they have little to fear from lesser sides - especially seeing as they have won six of their last seven league matches and had gone 14 matches without defeat before the champions-elect gave them a brutal reality check at Wembley. Spurs may well concede at the Amex, with midfielder Pascal Groß and striker Glenn Murray both presenting a goal threat for the home side. However, with their fearsome array of attacking talent, the visitors are likely to outscore their opponents.